Well, another year has come and gone and here we are again at the start of another adventure. It seems such a long time ago that I was flipping up crêpes on In-Depth Night in May last year. I have so many good memories from that project and night and I hope that I can create even more during my new journey this year! When deciding my project last year, though I did so somewhat hastily and unknowingly, I made it my goal to do one in-depth project in the “presenting” format, and one in the “performing” format. So, as due course, as last year I presented my fresh baked goods at a table for all to enjoy, this year I challenged myself to choose something wherein I would conclude my study with a performance in front of all the guests. With this in mind, there were a couple different ideas that popped up throughout the course of my decision. 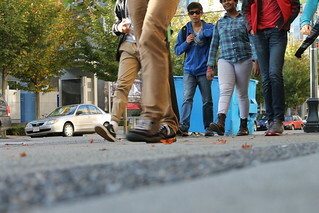 I thought of drumming, as I enjoy music and had fun when I got a small taste of the art last year in Beginner Guitar 11. I thought of song-writing, as I had been considering it for a while as something that I want to develop more, along with my guitar playing skills. 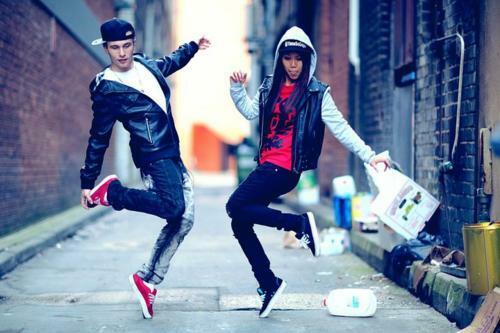 Then finally, I decided on hip hop dance. 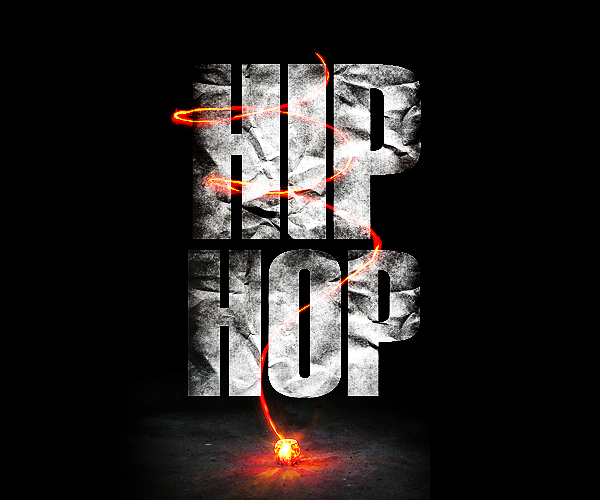 Hip Hop is something that I have wanted to try for a very long time, way back to when I did musical theatre outside of school in grades three and four and heard about some classes. I also figured that all my other ideas would be things that I would likely be willing to try on my own more later in life, whereas hip hop I thought I might need this extra push and tight support group to get me going. So off I went! Though I wouldn’t consider myself well practised or experienced, I have danced a little, on a spur the moment basis from time to time, and I have a lot of fun when I do so. My mom has reminded me that I did in fact take some dance classes when I was just a little girl. I participated in the “Tiny Tutus” Ballet class at a studio and also took some tap classes for a little bit. However, those weren’t really my thing, or at least those types of dance weren’t, and I drifted over more into sports. Over the years I have wanted to go back and try some new types of dance, and see what might or could happen if I really went for it and felt confident about myself trying it. So, when I thought about this project, I thought this would be the perfect opportunity to give it a shot, and try something that I really want to and think I will have a lot of fun doing! I was still a little nervous about this though as I’m really stepping out of my comfort zone so I asked around to see what other people were thinking of doing. 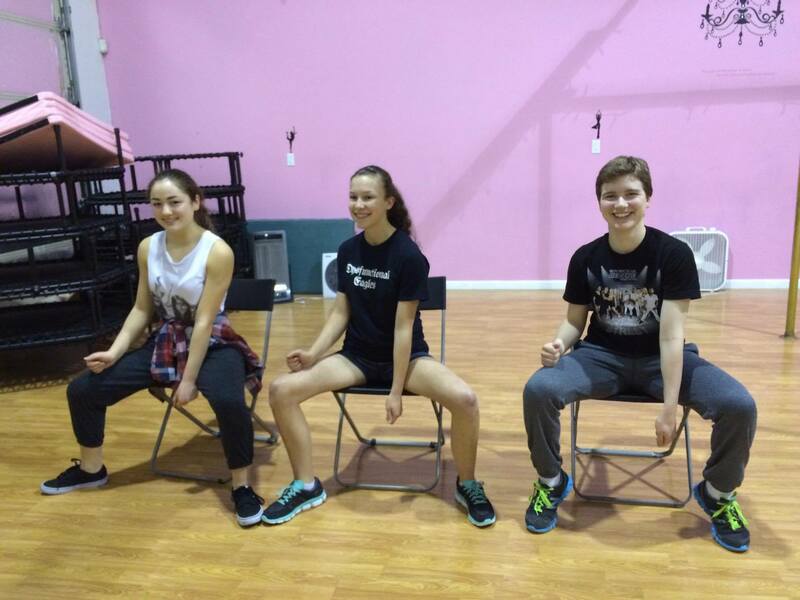 Turns out, two Alyssa and Elyssa both wanted to do hip hop too! 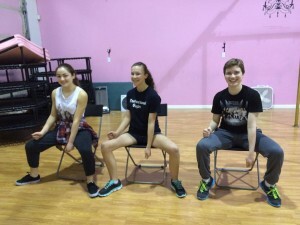 Thanks to some connections from a classmate the three of us had ourselves signed up in a beginner hip hop dance class where you learn and create routines in a music video format. Ultimately we film the product instead of performing it in front of an audience. The class will be starting at the beginning of February at Room to Move Dance and Fitness, and that will be my primary base and starting point of learning for my project. From there I hope to build in different areas of hip hop as the project goes on. At this point, my main mentor will be my dance teacher Bev Soh. 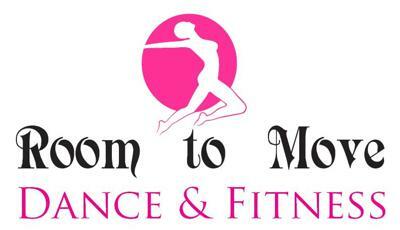 Bev is highly experienced in dance and choreography and was recommended as a very nice teacher for beginners! Our class will be taking place with Bev for five Tuesdays, over the course of which we will learn and then film a routine to the song Confident by Demi Lovato! You can check out Bev’s info on her website here! Leading up to this class, I plan on watching a few online tutorials and videos of hip hop and trying some out on my own, just to get a bit of a feel for it before I jump in the deep end head first. The group of us may also meet a few times to try out some things together. Following the class, I will work continuously with a different mentor, whom I will find prior to the conclusion of the sessions, until the end of the project. I also plan to meet with some other friends and possible new experts who can help me out with some moves in certain styles of hip hop. I hope to learn more about what some of those different genres are throughout the project and incorporate them into my final performance on in-depth night! A couple styles that I am particularly interested in trying, even though they are extremely difficult, are called animation and krump. I first heard of and saw these styles on an online video in the late spring last year of a contestant auditioning for the TV series/competition So You Think You Can Dance. I was absolutely blown away by what the contestant did in her routine and so I had to follow up and watch the whole season. She ended up making it to the final round and came second place overall, which I was very excited about! Now this show, does a tour, for all of the top ten dancers, all across the United States and Canada. Originally I had a conflict with the performances in Vancouver, which were last weekend, but at the last minute I realized that I was now able to go as I no longer had the conflict! This I was also very excited about. So naturally I asked my fellow hip hop in-depth dancers if they wanted to do with me, along with some other friends who I thought might be interested. Fortunately, Elyssa and I were able to get tickets only a couple days before the event and we attended the show last Saturday night in Abbotsford! We were able to capture a couple(low quality) clips of the show on my phone which I have uploaded two of my favourites of to YouTube for you to see! Here is my favourite, Jaja Vankova, the krumpist! This was her solo, sorry for the bad quality, and also don’t mind me cheering enthusiastically at the end of the clip! And here is another hip hop clip of one of my favourite intense routines from the season which they performed at the concert as well! This one includes the two contestants Virgil Gadson and Eddie “Neptune” Eskridge, who, like Jaja, were all a part of the Street Team on this season’s “Stage Vs. Street” format! This outing turned out to be a great introduction to my in-depth project as it got me very excited about dance and especially hip hop again after watching the season earlier in the year, and inspired to go and get going myself! It was a very fun evening as I hope this project will be, and also something very new for me, as if you can call this a concert, it would be my first (other than WeDay). I hope this is the start of a very fun adventure with lots of new things and challenges too! So now, here I go, hip, hop, and jumping into my next in-depth journey! For my leadership community leader interview I wanted to find someone who I was personally inspired by and look up to, or admire what they do. I considered a couple of options but after some thought I decided to pursue the Fire Chief of my home city, Port Moody. I did some research and identified that the current acting chief is Remo Faedo. I found the non-emergency phone number to contact the number one fire hall. After some phone tag and a few calls with the secretary at the main station I was able to set up a time to meet with Remo Faedo. It was an honour to be able to sit down and talk with him about some of the special and important things he and his team do in the community. I chose Remo because I really appreciate the work that fire fighters do in the community and at the top of it all is the chief. The chief of this organization needs to be an undeniably strong and fearless leader in dealing with all the different extensions of problems and events that fire fighters deal with daily. Overall, I felt that these were some of the most important qualities of a good leader and so I thought this would be a very valuable interview. I tried to focus on some of those things that I felt made him a good leader in the interview and really identify what the qualities are that make fire fighters such amazing people and leaders in general. As I talked to him, I understood more about some of these qualities. Remo Faedo told me, when asked about any awards he has received over the years, that he has received awards from the city as well as both the provincial and federal governments. “The BC award is a service award,” which recognizes Faedo for 20 years of service, “and the exemplary award comes from the federal government.” The federal award, he told me, recognizes him for 25 years of exemplary service. “The city is typical years of service awards.” He also told me. Clearly from these measures I could see that Faedo has put in his fair share of work to get to where he is now and has dedicated a very significant amount of effort to his duty. He has also been involved in the work for a very long time. Remo earlier explained to me how he first started out “wanting to do something for my community.” He began as a volunteer fire fighter in October of ’89 and “had the skill set and aptitude to become a volunteer fire fighter,” and “felt that that would be much more exciting than any other volunteer work the city could offer”. He then “became a career fire fighter in July of ’93, from which point he moved up to deputy chief in November of 2007 and he made the final step to Fire Chief in July of 2009. In terms of training, experience was all he needed, and so as you can tell by his awards, he has worked hard to gain that. He did however take various courses, both fire related and some business related, as well in order to develop the knowledge side of things for his job. He has also been involved in some education programs over the years related to the fire service. All of this “put me in a position where I was able to apply for the fire chief job and be successful.” Nonetheless, he pointed out, the most important part was the on-job experience, “You can’t overlook experience.” he told me. The most rewarding parts of the job, awards in the form of recognition you might say, are not those of the above mentioned sort he continued. “The ones that really impact you are the ones where you get cards or you get people that drop by that thank you for saving their life.” “Those are the most rewarding awards that you could get…that’s what drives us really more than anything else.” This is where I believe the work that Faedo, among his fellow fire fighters, has done and do is truly amazing. In terms of accomplishments and achievements you really cannot go farther than saving a person’s life, and that is what he and his co-workers strive to do every day. He described to me a call the crew recently responded to at an apartment building on Clarke Road. I had heard of this fire as it had been on many news sources and was a big fire for Port Moody. Faedo said “It was an exceptional save by our crew, and I was very proud of our fire fighters and the work they accomplished.” Thinking about it, it is quite remarkable to hear the inside, which most people don’t usually hear, and really see how much work and effort goes into that fire we saw on the news. A fire where no one was killed and it appeared to be a situation that had been handled under control, but not for the exceptional work of those fire fighters, it might have been a different news story. Something else that I asked the Fire Chief about was the new fire hall that was finished just this year in Port Moody after what appeared as many years of need of repair and replacement. He was happy to tell me how “I was involved in the entire process, so for me it was really quite rewarding to have this built during my ten year’s fire chief.” After it had been “about a ten year process from when we identified the need to when we moved in.” He continued to say how “the building turned out wonderfully” and because of its “high profile location in the community” “we spend a little bit of time and effort and money to make it look nice.” This was also clearly something that was a big accomplishment for not only Remo Faedo but also the whole fire staff at the fire hall and is something that they take pride in now. 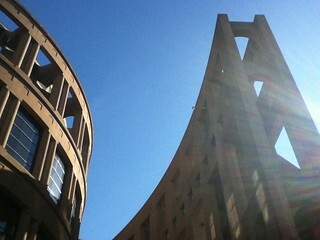 I personally was impressed by the building from the inside, as I have been of the outside since it was built. It certainly makes me proud of our fire fighters when I see it and I think it is something that is very important to making them proud of what they do as it is such a key part of their life and work. There are many things that point to exceptional qualities about Fire Chief Remo Faedo, from his many years of service and dedication to helping others, to his embodiment of the whole organization. I think to describe him as a leader, for me, first of all, his job is putting himself in danger in order to save the lives of people who he most likely does not know. I think that that alone is an act of true leadership where he is not only putting others before himself but also going beyond what is asked of any regular person. It’s not expected that you will run into a burning building filled with smoke, not knowing what to expect when you get inside, and yet, that is exactly what fire fighters do. And all of those fire fighters, are led by the chief. A chief who showed commitment and support of his team when he fought for a space that would put them in better health and comfort so they can focus on what they do. A chief who has dedicated much of his life to giving back to ordinary people. A chief, who like any other, has learned to overcome challenges and problem solve. Though he told me that he has not had any major obstacles throughout his career he said “the most difficult part of the job is dealing with people…everybody sees things differently and yet at the same time you have to work together.” He said this was probably his biggest challenge, “working with others in order to move forward as a department.” He mentioned the importance of how in this situation even if everyone didn’t get everything they wanted, everyone got something that they were happy with.” These are key pieces to any successful organization, and recognizing the value of these situations and outcomes is the sign of a good leader. One of the most amazing things from the interview however, was when I asked the Fire Chief about what drives him to help people who he doesn’t know to this extent on a daily basis, and to commit so much of himself to doing so. I guess it wasn’t so much of a well thought out question in asking what drives you, but it was inspirational to hear him talk about how it is really something they specifically look for when hiring, and a trait that you need to excel in the job. That trait is, the drive and will to help others, and they look for a history of that in a person when hiring. It was in a sense moving just to feel that support as an average kid in the community that there are all of these amazing people who spend their lives, and would ultimately risk their lives to save yours. I know that’s something that I probably already knew factually, but I do find it quite empowering to see that organization first-hand, what these people can do with their own two hands. I think these traits fairly speak for themselves as to why not only Remo Faedo but also all fire fighters are very effective community leaders. They are ones who will step up in times of trouble when everyone else is running away. They cooperate as a team to solve life-threatening problems on the fly. And they ultimately risk it all putting others’ lives before their own. I believe Remo is an effective community leader because he sets the example for all of these fire fighters and leads the way. He is the one inspiring them day-to-day and leading by example in the effort he has put towards the job. For these qualities I find the fire chief very inspiring and it certainly makes me want to do my part in the community, even just with little things, of giving back, seeing all that he does to help others. Overall, I think we can agree that Mr. Faedo does enough good in the community to cover about a thousand people, or more! I think these events are also a host ground for people to not only see what fire fighters do, but also become a part of something good giving back. These events are a direct act of inspiration for many people in the community, seeing what these men and women do for us, and wanting do to something for them but also for others. Lastly, as the fire chief and I were discussing at a different point in the interview, “People appreciate the fire department most after they’ve needed their service”. This was how I most directly came to appreciate what they do, seeing them respond and help someone who they have never met before, and this is how many people are also most thankful and inspired of what they do. I will take many things away from this interview with the Port Moody Fire Chief, especially including a greater appreciation for the effort that these men and women put in to help us, average people, any people. I will also take away how giving back and helping others is such an empowering feeling, and how its important that everyone does their part to help themselves and others be safe everyday. Even small things can help, the important part is that you care. It was certainly very moving to see that entire organization as something that is real and not just a station of superheroes, and it really put it into perspective to see how much work is behind every call they respond to with such ease. Thank you very much for reading this post about a phenomenal local leader, and I hope you have a new understanding of the work that your local fire fighters do and how some of the things that they do make them such good leaders! If I may say so myself, I think that will save strangers at the risk of your own life, is the epitome of a good leader. Well that’s it I guess. Like, really it. With a total of three field excursions, three interviews (both locally and globally), 13 blog posts, 2 speeches, and countless hours of research and preparation, I am finally done. Done it all, sadly, yet gladly. Many are joyous right now, that they have completed it all, finished all the tasks ticked all the boxes, not to say of course learnt tons along the way as well. But I am somewhat sad, or almost in between the two emotions somewhere. This year’s eminent was very different from last year’s for me. It came at me out of the blew, I wasn’t ready to decide who to study, not ready to go on my last library field trip with my amazing classmates in TALONS, not ready to prepare my speech or even write blog posts again, but it happened. It came, and it went, as everything does in this world. Nonetheless, it is not merely sadness nor in any way regret for this project that sits with me now as I write my final eminent reflection, but rather a sense of pride, hope, and completion. Unlike last year’s post where I was so overwhelmed with all the newness of everything that happens on a big TALONS night in and I finished with my word that I chose at closing circle, I am going to start with my word, and talk about what everything meant to me this year, how I felt. This year, we did not formally have a closing circle at the end of the night at least we didn’t go around and reflect on what we had just done like last year. However, many of us still thought to ourselves that night of a word that described what we individually had just experienced, a word that showed how we had done, how our friends had done, and how the guests had been, a word that suited us and also our projects. This is a fairly difficult task as you could imagine, considering all the different parts that go into such a big culminating event. There are two ways to approach this sort of task, I have learnt since last year’s eminent night, choosing a word off the top of your head that comes to mind at first thought, or thinking long and hard about the perfect one that you will remember forever. All in all, the results of these two options are often the same. Nonetheless, as I was already at home when I remembered to do this, I took the long route, unlike last year. When all was said and done, I settled on the word ‘love’. As I’ve mentioned before, and am beginning to realize is somewhat of a continuing theme and also goal for me this year, is how special spending time with friends is and developing new relationships. 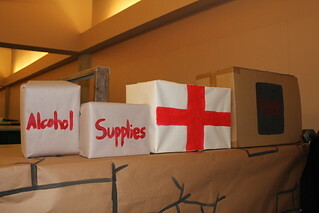 This theme came in to play from the beginning of the night when we were setting up our learning centres. A friend from outside of TALONS offered to help me, which I greatly appreciated as I had a very extensive centre especially in terms of set-up and, difficulty of set-up shall we say. As they say, many hands make light work, and as there was two of us hanging my giant sandbag wall from the ceiling at the front of my locker bay became a lot easier as we could have one person on top of the bay and one ripping tape below. This was such a kind act that really helped me stay on track and on time as like last year, I almost didn’t finish before dinner, additionally, in similarity, I had to make a couple last minute paint touch ups to finish off my centre and I almost ran out of time. And it didn’t exactly help that we had a surprise early guest arrival, but not in any way am I going to say that this arrival was a bad thing. You see, this guest, was the one and the only TALONS alumni, Kim Venn. 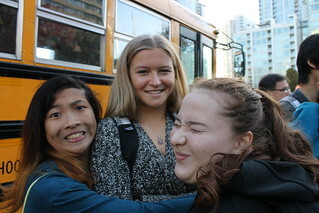 Now some of you may remember that Kim was the afternoon TALONS class’s peer tutor for second semester last spring, and then also joined us on the adventure trip. Let’s just say, that I highly respect her and all the amazing work that she does in many different areas. I also got to know Kim a bit on the adventure trip and also through Me to We last year, so it was sad when she graduated as she is four years older than me. Anyways, I had just been rushing back to the TALONS room to grab some red paint for a couple spot touches, when I peeled around the corner and Elyssa calls to me while doing so that Kim has arrived. So, as you may expect, I was quite excited, I proceeded to sprint to my station and drop the paint and brush down in the hall in front of it, meanwhile Nicole, who also knew Kim quite well, and I am very good friends with, comes rushing over to me and points down the stairwell to where none-other than Kim is standing. Long-story short, we had a nice reunion downstairs as well as getting some expert tips on our speeches before returning to finish up prep on our stations. I thought it was very nice of Kim to spend some time giving us some very useful tips on how to practice and be confident in our speeches, and some tools to use if we ever got stuck. Then after our final preps, and our tasty dinners, we had our last rehearsals on stage. Getting those jitters out didn’t really come till when it was all over for me, and even then there was positive jitters. I had a practice with my sound effect for the ending of my speech, and began to feel the elevation of the stage, physically, emotionally, and mentally. But there was still around an hour to go. 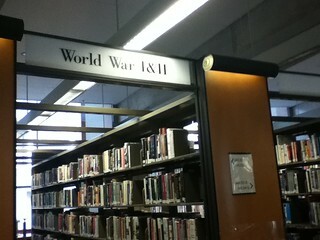 An hour until I set foot into the battlefield of Pervyse, and dashed out in to No-Man’s Land to save lives. This hour was where I really got the word love from. I think this was my favourite part of the night. The two hours it all happens. You clear the stage a final time, the curtains are closed. Then, you hear the guests load the theatre. 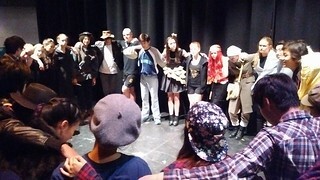 As I had pictured, and remembered, and watched last year, we as a team of tens, not only classmates or friends but a true team for a night, with one goal and purpose, huddled up backstage. Once one goes, there is no turning back, you will be up soon. 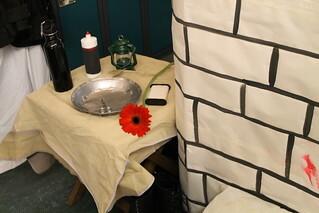 I rehearsed my speech many times backstage, silently and whispering lightly behind the second curtain. I also helped Julia work through hers many times so that she was as comfortable as possible for that moment when she walked on stage. 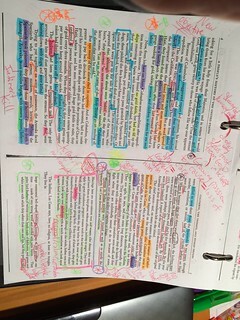 We worked through the speeches. One would go on, and a minute or so later come off, breathing or laughing or smiling or wanting a hug, they had done it. This was where I felt the real love of the night. Our ‘team’ was so supportive of everyone. I had to wait till second last in the act, but everyone even if they had already gone was so positive and reinforcing. the kept saying that I was going to kill it, I was going to do fine. And then the moment came, Chris, the performer before me, went on stage. There wasn’t enough time to practice again, I had no choice. Just ‘breath’ and make sure everything is ready. Everyone gave me some final reassurances as I really began to panic. And then I went into the curtain. That five seconds before I stepped onstage were some of the most nerve-racking I have ever experienced, and then you just have to step out. At the end of it all I got to go for a run, down out into No Man’s Land, and then back behind the trenches again. When I reached the top of the stairs seeing a couple of my friend’s faces, I fist-pumped and jumped about three feet in the air. I was just straight pumped. I had done it. I had made it back from No Man’s Land alive. I hadn’t been killed or shot done, and I hadn’t forgotten the soldier along the way. The we got to relax and watch all the other speeches upstairs. It was painful watching a couple of our teamates stumble on a few words, we were all wishing them to success, we all supported each other no matter the outcome. In the end we all did survive. And as Mr. Jackson said, we are now what you could call “Senior TALONS”. I enjoyed visiting with some old grade 11 classmates at my learning centre, though I was in character. I did my best to answer guests’ questions as best I could trying to cover all perspectives while in the one voice of Mairi Chisholm. I did my best, trying to answer questions such as why did you choose Mairi Chisholm by explaining how we weren’t just ordinary nurses and we really were just doing our part with the men. I was also very proud of myself for keeping up my British accent the whole night, and this was particularly fulfilling when I got the honest approval of a few Brits themselves who visited my station! 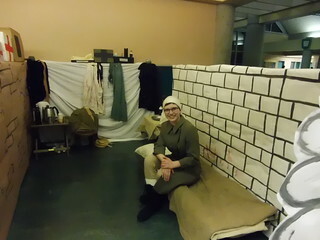 Me as Mairi Chisholm in front of my sandbagged Cellar House (learning centre). 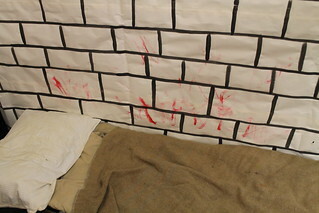 Makeshift medical treatment bed in our cellar house with dirtied brick wall. An old chair inside our cellar house with my satchel and a spare shirt(authentic Second World War use by my grandfather). Some stored materials in our cellar house. A look at our small workspace in the cellar house. Some of the important tools handy for quick use: a lantern, water, string, scissors, morphine. Me in my cellar house posing on the bed. A red cross on the outside of our house to make it clear we aren’t here to do any harm. Just inside you can see a dirty stretcher. I think I can say that I tried my best to represent the truly outstanding person that Mairi Chisholm was and also her partner in Elsie Knocker, and I hope that if either of them could see me on our Night of the Notables that they would be proud of me and more importantly them. I am very glad that I managed to find such an amazing person to study for this project and I will always remember her remarkable story. And in regard to the love theme, well I just loved studying these two and this project in general, I had so much fun! That love amongst our team was felt right to the end of the night when we all said bye to each other. And as we didn’t do an official closing circle, I think it was in a way symbolic. That for us as tens, though it is the end this project forever, it’s just the beginning of a future, beyond TALONS, and as a new program this year, it is just the beginning of something new! So as they say in High School Musical, “It’s the start of something new, it feels so right to be here with you”, because it truly did. I visited and used a lot of different sources throughout this project as I was less familiar with the area and person than I was last year. I came across many different highly useful sources, but some were particularly helpful. I have linked and discussed these ones below. 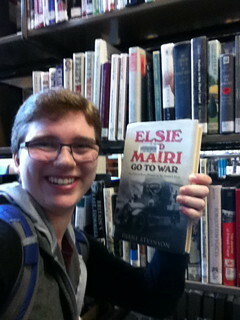 First and foremost, you may remember that I have been utilising a book called Elsie and Mairi Go to War that I got from the library on our field trip at the beginning of the project. I was very fortunate to find this book in my quick research on different possible books for my project prior to our field trip as it is an all inclusive biography of both or these two phenomenal women. The book includes a significant amount of background information on the childhoods of the two ladies as well as then some early and young life information on Elsie as she was many years older than Mairi. There is then multiple chapters on different parts of their wartime experiences. The author tries to base the book’s content on, and largely use, Elsie and Mairi’s very own diaries from during the war. 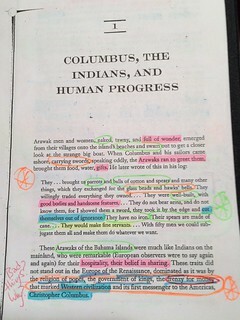 She incorporates many quotes and even entire sections from their journals making the book very first-hand and valid. The book also includes some closing information on the two’s lives following the war, and ends with a very valuable section on useful resources that can be publicly accessed about Elsie and Mairi. Additionally, I used this book to access the author for my interview, who specifically notes in the back of her book that she wants to help and guide readers in learning more about these two remarkable women and their lives. If you wish to learn more about Elsie Knocker and Mairi Chisholm, then this book is, without a doubt, the place to start. 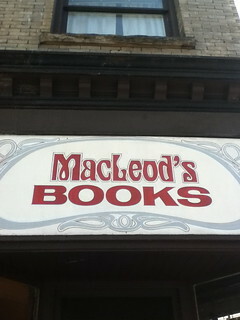 The next source that I will mention I found mentioned in the book Elsie and Mairi Go to War itself! In her book, Diane Atkinson mentions two interviews done with Mairi Chisholm in the late 1960s and early ’70s, which are now stored at the Imperial War Museum. I was extremely excited when I was able to find these myself online on the Imperial War Museum’s (IWM) website and was ecstatic when I listened to them for the first time. I was so amazed by the fact that I was actually listening to my eminent person, who was herself on the front lines in the First World War tending to endless wounded with her friend Elsie. I listened to all four parts of the interview (“reels” as they are called) while preparing for my presentation. As you go through the reels she is asked about different parts of her wartime life from leading up to the war to her and Elsie’s relationship following it. What I particularly found useful from this resource was all the little details and stories that she talked about that you can’t find in a book or on a website. This helped me to further understand Mairi’s emotions towards the events she participated in, what type of person she was, and also, of course, what her accent sounded like. I also found these very useful as I am not one for huge amounts of reading, and so hearing Mairi talk about her experiences herself was not only unbelievable but also efficient as I could work on other parts of my project at the same time! You can find these interviews here and I would suggest checking them out if you would love to be thrown back in history yourself! One of the first websites I came across, was a comprehensive overview of what Elsie and Mairi did and how. It includes many images of where they worked and a map showing their three different posts in Pervyse where they worked at and retreated to at various points in the war. The article also talks about how they became so famous during the war and what exactly they did to gain the support they needed to run their stations. I thought this was a valid source as it was on the BBC’s website and is also linked through the author to Belgium and the region itself with details of the village now and then. Of course I also visited trusty Wikipedia for information on all of my eminent person Mairi Chisholm, her partner in action Elsie Knocker, and my interviewee Diane Atkinson. These visits gave me some good background information on all of them and were especially helpful in covering all the basics of info when I was trying to decide which of the two to do for my project. Throughout my research I also came across multiple articles on the two women with the theme of sexism and gender roles in the First World War. One of these, linked here, which also talks about many other women involved in the war, highlights the remarkable work that these women managed to complete in times of horror and struggle even when the odds were against them specifically. It gives brief yet amazing stories of many women who were heroines and countless different tasks and duties during the wartime. This site would also be useful if you were looking for a women to study in this field. One site was of particular value in reading as the author obviously cares a lot about the acknowledgement of Elsie and Mairi’s work. It talks about the book on the two itself but in doing so also contains many details of everyday tasks that outline what life was like for the two in their beaten down cellar house and village. This article gives readers a real reason to understand how remarkable these two women were and how truly outstanding not only their care to the soldiers was, but their care to themselves and their safety as well. 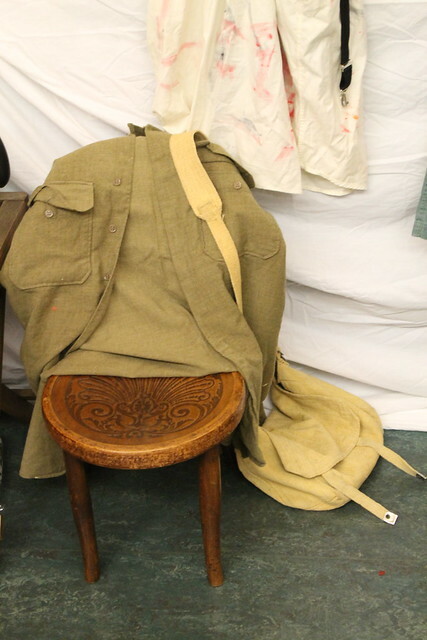 In the final days leading up to my presentation and learning centre, I wanted to make sure I really knew my stuff about what life was like during the war and the conditions that their post would have been in when they were doing all their work. In attempt to achieve this I was sifting through many different articles and also trying to find some videos about the two nurses, and I may have gotten a little distracted. I ended up watching roughly the last 45 minutes or so of the movie Passchendale, which can we say, is a fairly heart-wrenching experience. The movie follows the story of a nurse, her boyfriend, and her brother leading in to them all crossing paths with each other in one of the most famous battles of the First World War. I won’t spill the ending, but it is a very raw and painful experience to see what so many soldiers, nurses, and other people went through because of the war. However, this movie did not solely take up my time in the sense of watching a movie, it also helped me visually see and get a picture of this reality of what life was like and what Mairi Chisholm, and her partner, must have seen on the day-to-day. I can’t imagine how they went through it all with so much strength and held their faith when everyone around them was losing theirs. Below I have linked the movie, feel free to check it out, it came out fairly recently in only 2008 and is also a very popular film. The battle itself involved many nations, including our very own Canada, and remains one of the most horrific in history to this day. Lastly, this source was one of my favourites to read and has an all-happy mood to it. This article is one of the featured pages on Diane Atkinson’s author website and tells of the celebration of the unveiling of the statue of Mairi and Elsie and their wartime dog Shot in Pervyse, that Diane was in large part the cause of. This unveiling marked a huge point in recognition of these two women and shows that they are just as heroic, relevant, and eminent as the many other men, and women, who have had similar memorial figures presented. Something very cool was that members of Mairi’s family were in fact in attendance at the event, certainly an honour to see such a tribute being given to their family member. This was a great article to read and showed how after all the hard work Diane and a reader of the book together had done, had gotten the proper recognition created for its rightful owners. Through all of these different sources I got a very full look at Mairi Chisholm’s story from before, during, and after the war, and what it took to do exactly what she did. I felt honoured and privileged while researching to be learning about such an amazing person and all she had done to help others, and I just wanted to soak up as much information as I could. I think these resources gave me a good understanding of what Mairi and Elsie did, but there will always be many things that I don’t and can’t know. Nonetheless, I hope to be able to continue learning more about these two women and also the First World War in the future as it is key part of our history, and something that we cannot forget. Over the course of this project I have been reading through a comprehensive biography on both Mairi Chisholm and Elsie Knocker, Elsie and Mairi Go To War, which I got on our earlier library field trip. So, the first person I thought of to contact for an interview for my project was, you guessed it, the author of the book! I found the author, Diane Atkinson’s, website online and was able to contact her using the information email posted on her site. I was very excited when she replied the next day! Diane has “a PhD on the politics of women’s sweated labour” and an MA on Life Writing. She also worked at the Museum of London “as a lecturer and curator specializing in women’s history.” These qualifications were noted in the author’s biography in the back of the book. She has been the author of three other acclaimed novels that give light on various women’s issues and rights one of which was made into a documentary film in 2008. She published her book on the two nurses in 2009 which drew much attention to their miraculous war efforts. 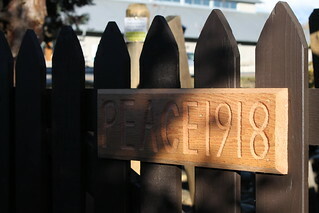 With the help of a highly interested reader, they were able to fundraise enough to have a life-size bronze sculpture made and displayed in Ypres, ten miles from Pervyse, where Elsie and Mairi had treated soldiers in their cellar. The statue was unveiled just last year on November 22nd, 2014, exactly one hundred years after they started giving soldiers what was and still is known as ‘golden-hour treatment’ at Pervyse. This treatment was the basic first aid given to the wounded within the first hour of a serious injury or traumatic incident when it was most likely to prevent death. The rising of this statue was a great success in their story and recognition as it was long overdue for the work they did and lives they saved, and their lives they devoted to their time in Belgium. The statue also includes their terrier Shot, who saved their lives by barking to wake them during a gas attack. Unfortunately, he died in his heroism, but he was always a huge part of Elsie and Mairi’s daily life in Pervyse. Follow this link to Diane’s very interesting page on her website about the statue ceremony. So on to the interview. As I earlier stated, I found Diane’s email on her author website and sent her an email explaining who I am and what I am doing. She replied and was glad to hear that I was reading and enjoying her book. She said would be willing to answer some questions via email, as of course, we live a few time zones apart and not exactly within driving distance. I then sent her another email with some questions that I hoped were thoughtful and she might be able to give me a new perspective on. Below I have listed my questions and her responses. What inspired you to write the book on these two women? Or what did you enjoy about writing it? I saw a photograph of two women titled The Madonnas of Pervyse and was intrigued by the image and the caption and was curious to find out who they were and what it meant. I was delighted to read their diaries and correspondence and build up a picture of them and their extraordinary work which demonstrated their outstanding courage and compassion. What was something that surprised you in your research about them? I wasn’t surprised about anything I discovered about them – they were extraordinary people. How do you think Elsie Knocker impacted Mairi’s life and vise versa, Mairi to Elsie? This is well covered in the book, but remember Elsie was older and more experienced than Mairi who had just left school when they met motorbiking. I think Elsie needed the calmness of Mairi’s gentle spirit to keep going through all the difficult times. They were a very good team. What would you say was the biggest challenge or obstacle for Mairi to be able to do what she did, either before or during? Her mother’s objection to her having a motorbike and then going to Belgium was serious issue but her father was very supportive. This caused friction all through the war and after I am sure. How do you think these two women, or specifically Mairi Chisholm, impacted women’s history, rights, or involvement in social issues, events, or crises? We can’t make this assessment yet – their story is still not widely known. My book came out in 2009 and it will take time for them to become more widely appreciated. The statue I raised the money for in Ypres is a big boost to wider awareness but these things take time. Thanks to your book I was able to locate the amazing online resources of the Imperial War Museum, including the audio of an interview with Mairi Chisholm herself that you mention in your book. Is there any other resources that you would suggest I look into during my research? Almost all the material on them is held either at the IWM or the National Library of Scotland. Why are you passionate about spreading the knowledge of what Elsie Knocker and Mairi Chisholm did during the war and their contributions? I think the reasons are evident in the book. E and M were outstandingly courageous and caring – remember they did all of that unpaid, spent all their savings doing it and risked their lives on a daily basis, were nearly killed on several occasions. Everyone needs to know about what they did and be inspired by them. I sent her another email after receiving her answers thanking her for her assistance in my project and her work on the book and getting Elsie and Mairi recognized in general. Through this interview she pointed a couple new and different points that I hadn’t thought of and also helped to clarify a couple of things regarding the two. Her book has also helped me greatly in my research as it includes some sources, as also mentioned in the interview, that contain invaluable materials such as an audio interview with Mairi Chisholm herself. For this I also thanked her in my emails. Diane has helped me to understand what phenomenal women Elsie and Mairi were and I hope that I can show that through my performance on the Night of the Notables and also at my learning centre. Some main points like the fact that they did it all without profit really put it into terms for me. I am honoured to have received such a valid opinion on my eminent person and to have been exposed to such great resources. Thank you to Diane Atkinson again for your amazing assistance in my project and for your efforts towards getting Elsie and Mairi recognized for the truly outstanding women that they were. I will do my best to represent them well! While at their cellar house in Pervyse, Mairi Chisholm and Elsie Knocker did a plentiful amount of work in the trenches themselves. The two loved to be near the action: bringing soup and hot cocoa to the men living in disgusting, dank, ditches in the ground, carrying with their own hands and over their shoulders downed pilots from the middle of a battlefield, and driving men back to more extensive care in their ambulance along potholed roads and under shellfire on either side. 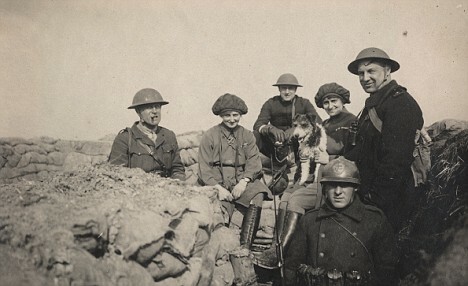 There are many photographs of the two in trenches pleasantly chatting with officers and soldiers during quiet hours. So today, I decided to try my hand at being in a trench. 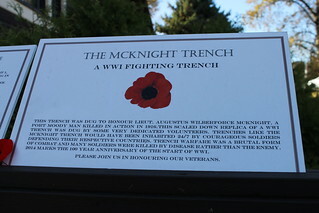 I visited the local Port Moody Station Museum that has had a display of a voluntarily recreated trench, known as the McKnight Trench, open since the centennial of the end of the First World War, last year. 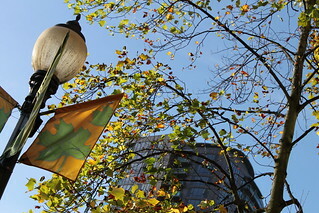 The soldier it was named after, Augustus Wilberforce McKnight, was from Port Moody. I have been meaning to go and check out this neat interactive recreation of history since it opened and I thought that it would be a great opportunity to learn more about what it was really like in those trenches and the battlefields during those rough times. So, my dad and I went to check it out. Unfortunately when we got there, we were told that the trench was closed for a privately scheduled photo shoot and so we were not able to actually go into the trench. However, the museum worker showed us to the back balcony of the museum where we had a good view from above of the trench’s inside. 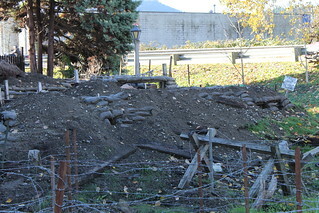 The centre block of the trench surrounded by a duckboard pathway. An artillery outcropping in the middle of the trench, the centre block from above. You can see the gun slit and a raised bench for the gunman. 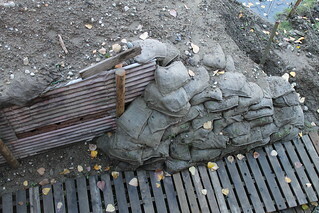 A duckboard pathway at the back of the trench with a sign above on one of the posts and sandbags for stability and protection. 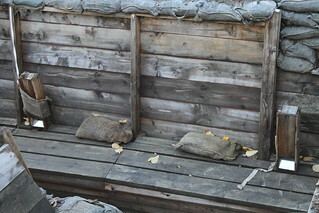 A bench along the side of one of the passages with two periscopes for looking out into No Man’s Land, and two sandbags that might have been used for pillows or comfort during sleeptime or for rest. We were also able to go around to either side of the grounds by the gates to the trench to view it from a different angle. At the eastern end I was able to also get some pictures of the recreation of what the battlefield may have looked like to soldiers crossing through No Man’s Land and the immense amount of barbed wire and other obstacles that they would have encountered. 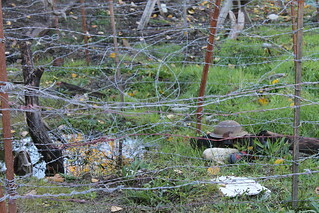 A soldier’s “Tin Hat” helmet laying in No Man’s Land, likely blown off from a shell explosion and left there. Also a large puddle, only small compared to some of the water filled craters (created from shell explosion) the soldiers would have encountered in the war. You can see the artillery slit from the middle block inside the trench sticking up where guns would have been aimed out. Additionally, the intimidating slopes of the looming trenches over the battlefield would have been daunting and challenging for enemies to overcome. 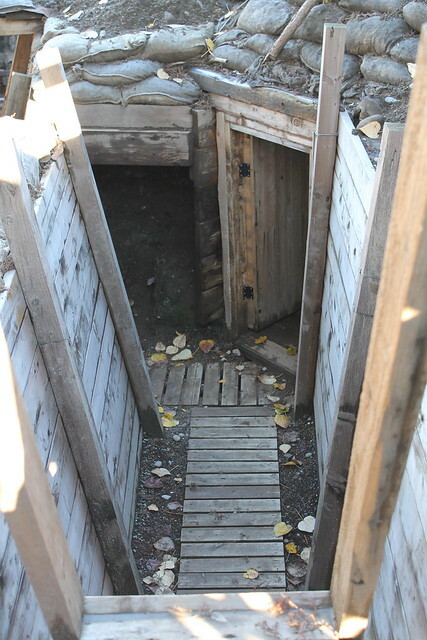 The ladder leading down into the trench at an entrance and the opening on the back right to a tunnel that could have led underground to below German lines where the Allies would have listened to their discussions. 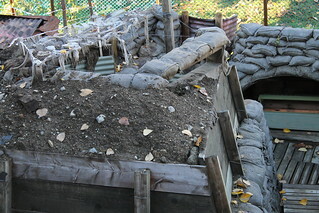 Duckboards are installed to try to reduce mud and muck at the bottom of the trench for walking on and the wooden sides support the land in hopes of not caving in in the event of nearby shell explosions. 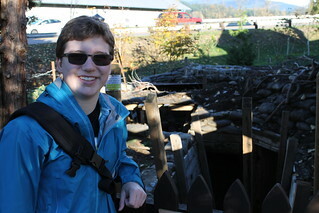 Me at the western gate with the trench in the background. I found it amazing how men could have lived in these conditions and settings for such long periods of time. I was only there for a short period of time, and wasn’t actually down in the trenches, but as it was shady behind the museum, it was very cold. It’s not even winter yet either! 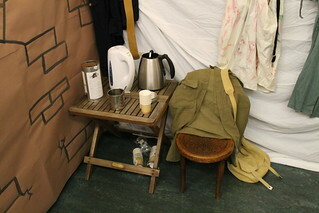 It made me think of how much the soldiers must have appreciated Elsie and Mairi bringing them some warm food and drinks and also other helpful things in the wet and damp trenches like dry socks. I tried to put myself in their shoes in those trenches, and what I thought was that it must have been so inspiring and uplifting to see your counterpart, women (to the men soldiers) stepping up and helping you out, especially when it wasn’t expected or even really allowed. 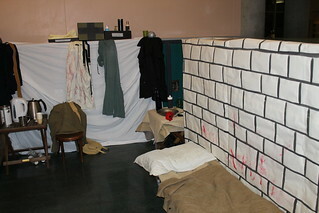 It was also shocking for me as this kind of brought to life how rough cut and dirty it must have been on a day to day basis, and you were there 24/7, there was no going home to warm up and dry off at night. Elsie and Mairi would have lived in similar conditions, though they had a small building, it was half demolished and broken down everywhere and had no amenities of a normal house we would think of. I think what they did was really remarkable, when you think about, how it was really a collection of small actions by a couple of determined women behind the lines of one battlefield, in one country, helping one person at a time. 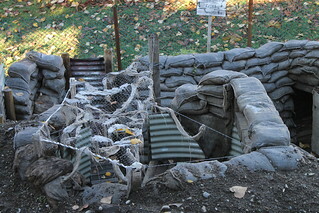 Seeing this trench was not only very cool to see as it is a recreation of so many historic scenes, but also a reminder and an eye-opener to how real and raw all of it was. I am glad that I went to visit the McKnight trench as it has really helped me understand and put into perspective how truly unbelievable these two women were, and also all the men with whom they spent their days. With the revving of an engine and the shot of a starting pistol, it begins. At long last I have chosen my eminent person, and so without further ado, let me get right down to it. I will add, that there is some reasoning as to why I took so very long to decide on who I will be studying for this project, and that with these circumstances in mind I have not been doing entirely nothing over the past few weeks, in fact, I have done quite a fair amount. I started out by researching different people whom I might be interested in studying for the project. As I studied a basketball player last year, my idol as I am also a player, I thought this would be a good opportunity to change things up a bit. However, as I got into researching, I re-encountered my problem from last year, my indecisiveness. 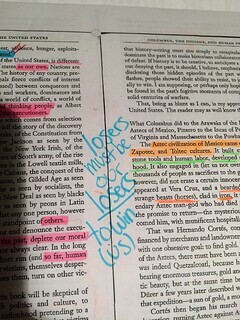 Sooo, after a lot of researching, I found someone, or should I say some people, that I was very passionate about studying. I remembered that last year I had thought during the project that it might be interesting to study someone related to the First World War, as I am very interested in the history of that global crisis and the project also falls over Remembrance Day. 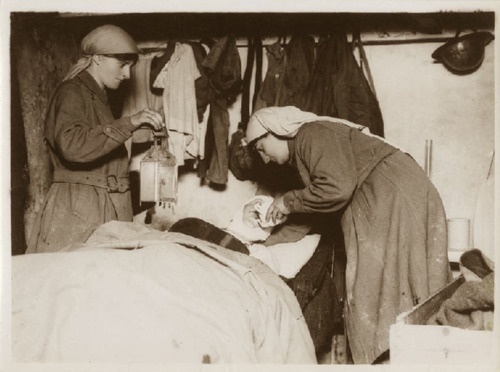 I came across two women who proved the female identity of the era wrong by starting up their own first aid post only hundreds of metres back from the Western Front in Belgium during the First World War. Elsie Knocker (left) and Mairi Chisholm (right) outside one of their cellar houses in Pervyse. So then, the next issue presented itself as which one of them to do. So after even more research, I came to the light conclusion that one of them, as she was significantly older, was more of the initiator of their contributions and actions. Unfortunately, after starting to write this post, I realized as I somewhat suspected and had earlier thought, that I was more personally and emotionally connected or attached to the younger one. So off I went yet again, rethinking. Finally, I can now finally tell you, that I will be doing this project on Mairi Chisholm. However(I know, uh oh), I will be mentioning Elsie significantly throughout the project for obvious reasons. They were a team, and every team-mate is valuable, no matter the position. So given these circumstances, I have done almost all of my research on my person already, and quite a bit on her partner in crime. Mairi Chisholm was born in the fishing town of Nairn, Scotland, on February 26th, 1896, but moved to Dorset, England when she was only four years old. Mairi had a very traditional upbringing, and became very close with her brother Uailean over the years as their parents were never large figures of close support to them. She had another sibling, Lucy Margaret, but Mairi and her brother were not as close with their younger sister as she came many years later and the two were away at school for her infant-hood. Mairi attended two different schools for her education, both of which appear to have been very supportive of Mairi throughout her youth and development as a young woman. It has been recorded that teachers from both of her schools contacted her whilst her later war efforts took place. One noted particular pride and love for the young student who was now making headlines in her homeland. I think I connect in a small sense to Mairi to these points as I like to get to know and try to stay in contact with my teachers following my time in their classes. Her family was of high rank in society, and in 1910 the King of England, Edward VII and his wife came for a game of cards with the Chisholms. However, Mairi proved to be a unique case for this style of living and was certainly not a typical young lady her status. 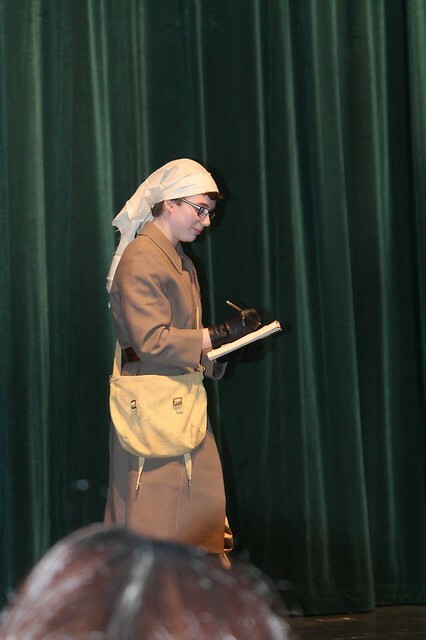 Mairi developed a passion for mechanics. Her brother rode motorbikes and together they entered races; she helped with maintaining the bike and he rode. Her mother disapproved of this thoroughly but her father proclaimed that she was a natural mechanic and must continue doing what she loved. I feel a personal connection to these characteristics of Mairi as I am not what one might call a “girly-girl” persay. I am very into sports and don’t like to dress up too fancy in general terms. So I feel that I connect well to Mairi in that way. Continuing, it was at these very motorcycling events that Mairi encountered who would become her longtime business partner, “Gypsy”, or Elsie Knocker. Elsie had made a name for herself in the world of motorcycle racing as she was a pioneer of the women’s participation in the sport itself. She had her own women’s riding clothing line and was known for ripping down country roads in races beyond belief for a woman. Additionally, she was one of the few divorcees in England at the time. It was unusual for a woman to vouch for and succeed in a separation of her own will, but she had done it. As she too was from a wealthy background, she had purchased the assistance of her own lawyer and made it all the way through the process so she could escape with her young son from an abusive relationship. 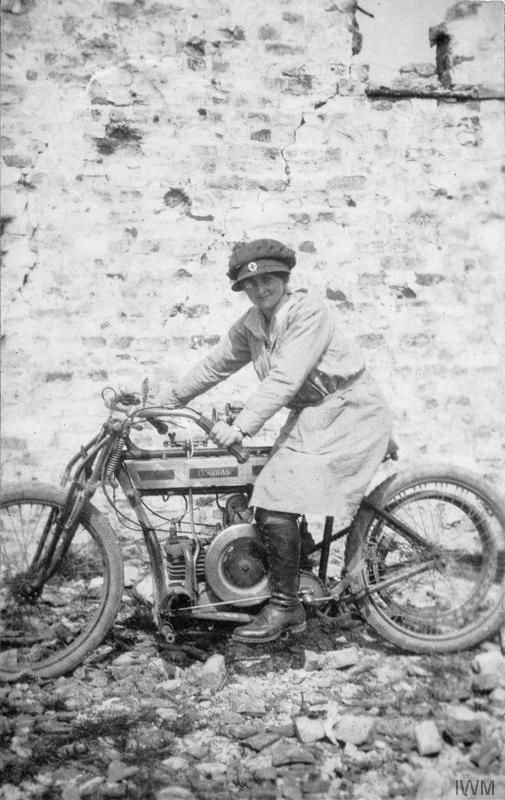 After meeting each other, they became friends through motor-cycling, and later worked together in the Women’s Emergency Corps in London, England. Then, after some time working in the field with an independent ambulance corps led by Dr Hector Munro, the Flying Ambulance Corps, their adventures really began. I won’t get into too much depth here as I want to save some of the juicy details for later on, but what they did was truly amazing. It started out as a soup kitchen, only metres back from the front lines in the cellar of a well battered house. The ravaged town of Pervyse in Belgium it was, where they make their efforts that entitle them to infinite recognition for courage and bravery. They would spend their days and nights ferrying pots and buckets of hot chocolate and broth out to the front lines. They went so far as sharing a warm cup with both a German and Belgian sentry in the dark of night in the middle of No Man’s Land. This small project grew into something bigger when they really got down to work. Elsie had been inspired when she saw how many men were dying in their ambulance on the bumpy drives back from the front to the hospitals. Elsie had suggested, and Mairi had agreed to leave the safety of their previous team and go it on their own. And so save more lives they did. Their small cellar house turned into a celebrated nursing station. 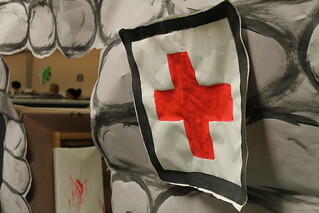 They gave care where most it needed and then sent off their bandaged up patients for further care elsewhere if need be. They managed this on an unimaginably low budget that forced them to leave their work for short periods of time to fundraise back home. They would return as fierce and prepared as they had been before, and leave no less wounded un-tended to. Braving the horrific sights of men physically destroyed by the combat, and risking their lives carrying men by hand and shoulders out from the midst of No Man’s Land to safety for treatment. Elsie Knocker (left) and Mairi Chisholm (right) observing the front from a trench. Oh, and unsurprisingly, they became the most photographed women of the first world war during their efforts. The both of them also received close to ten medals and recognitions for their unforgettable work. But that’s what is important, it was “unforgettable” work that these two did during times of peril and fear. Even today, few know who these women were or what they did. 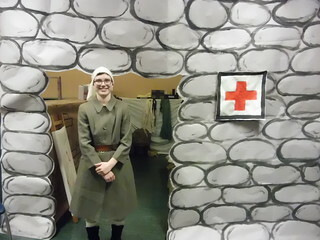 They are often overshadowed by other wartime nurses and figures. 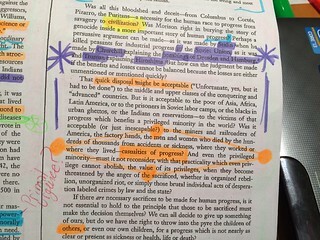 This is why I feel it is important to share their contributions with everyone and one of the reasons I wanted to study them for this project. I also share a personal connection in that my great grandfather was a decorated British officer in the First World War. Further, I like to think, or hope, I would be the type of person who would try to do something like what these women did in times of trouble. I was inspired by Elsie and Mairi’s story and I am glad to pass it on to others. I look forward to understanding their work more and more with this project.